Adrian Smith and Dave Murray developed the trademark Iron Maiden sound by combining their lead guitars to make dual solos. 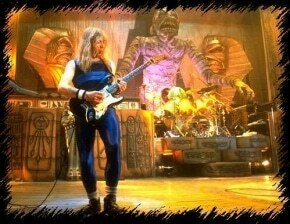 Smith left the band and was replaced by Janick Gers, but when Adrian Smith later rejoined Iron Maiden the trio setup was born. Adrian built his own style by fusing blues-influence licks, arpeggios and some modal playing. This combination gave him a more melodic sound, but at the same time maintained a blues-rock feel with the aggressive metal guitar sound. – Check out more easy songs to play on guitar. Below is an example of how artists develop their own voice by fusing different influences, and how you can develop your own style entirely. As well having immense technical control and fretboard fluency, there is also a great musicality about smith’s playing. Adrian Smith – style lead lick — This lick uses bends and open string pull-offs. Ensure you keep an even dynamic between the picked notes and open string pull-offs. Adrian Smith – style pedal point lick — This is a pedal type lick that pedals on an E note. Make sure you use alternate picking exclusively for this lick. It’s important that you really feel where the downbeat is when playing this, so tap your foot and use a metronome when practicing. Adrian Smith – style riff — The main thing to understand about this Iron Maiden riff is the use of accentuation on certain beats. You should really make these notes jump out by adding a little more bite to them. 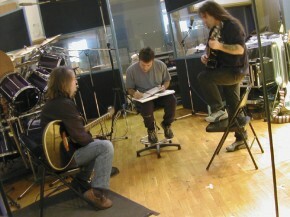 Control the duration of the open fifth string by using the palm of your right hand.